Romanesco is a winter favorite in my CSA box. 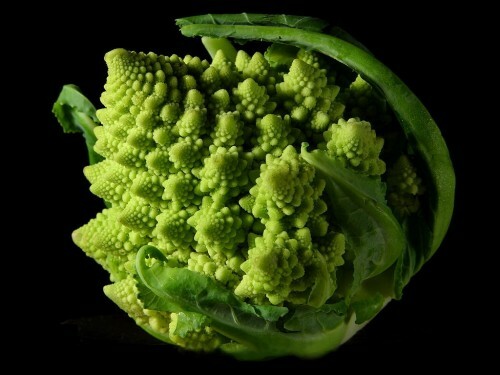 This cauliflower cousin is a most inventive cross of vegetables along with it’s own genetic twists, literally, with tiny concentric twists of flower-like points. The flavor and texture is similar to cauliflower, but prettier and much more fun to eat! As often happens on CSA delivery day I receive an SOS email from my friend Trudy. “What are you cooking with the…. ?” But this week it was Trudy who volunteered her favorite way to cook Romanesco, a variation on a recipe in Alice Water’s cookbook The Art of Simple Food. A simple seasoning of garlic, cumin, turmeric and salt that yield a most complex result. It transforms cauliflower too. If you don’t fancy those flavors, then simply steam or sauté romanesco in olive oil with or without garlic and a sprinkle of salt. But don’t over-cook; this veggie is best tender-crisp. NOTE to our valued subscribers: We had a glitch in our blog recently, so you’ve not received notices. We hope you’ll scroll through to see recent posts for Rita’s Moroccan Orange Date Salad and Bitters Gravy with Roast Beef , and Rosie’s Healthy Blueberry Bran Muffins. Romanesco is quite seasonal. Look for it at farmers markets and well-stocked produce departments now. 1) Cut Romanesco vertically into quarters; trim and discard core. Reserve leaves to cook with the romanesco. Cut them if they’re large. 2) Cut quarters into 1/2- inch thick wedges. 3) Heat a wide skillet over medium heat; add a generous pour of olive oil and a couple cloves of pressed or minced garlic. 4) Add Romanesco, the leaves and 2 tablespoons water; sprinkle with enough cumin and turmeric to lightly color the romanesco. Sprinkle with salt. I recommend Kosher salt because the larger crystals add a dance of salt on the tongue, a little different than table salt. 5) Cover the pan and cook about 5 minutes on medium-high heat until romanesco starts to soften. Uncover and cook until tender-crisp and slightly browned, shaking or stirring several times. Pressure in the Kitchen - literally! Delightful! So colorful, too. Better than cauliflower…… for sure! Thanks, Rosemary! Your photo looks great – you and the vegetables too! I will try this. I’ve come to adore roasted cauliflower, although I do it in the oven. Do you think this one could be done that way too? Hi Mary Lynne, thanks for your comment! Yes, you can definitely do this recipe in the oven. Just season the romanesco, or cauliflower, with garlic and the spices. I love cauliflower but this looks so intrigueing ! Recipe looks easy will definitely try it. You’ll like Romanesco if you like cauliflower. Let us know if you like the recipe! Thanks Susan – we’ve missed posting too! Having quite a glitch in our automatic notice mechanism, and posted this one manually. Do try Romanesco before it’s out of season. I’m sure you’ll love it as much or more than cauliflower. 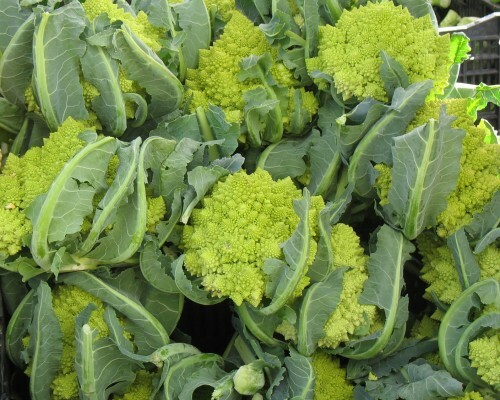 Can’t wait to find and try Romanesco! It’s not often I find a “new” to me veggie. Sounds yummy! Hi Jenna — I’d love to know if you find it in Mooresville, NC. It has been in our farmers markets for a couple months, but I’ve not seen it at major supermarkets.